Ever since I really started getting into essential oils, I have wanted to put an essential oil diffuser in every room. It’s so much better than using harmful air fresheners, and many of them can double as night lights. I recently had the opportunity to test out the Gurin ultrasonic aromatherapy diffuser. This diffuser is said to put out 2.4 million ultrasonic vibrations per second while ionizing essential oil molecules into the air using a heat-free diffusion method. This is the second diffuser I have used, and there are a few things I like about this one. First is the water / essential oil capacity. It holds a lot more than my other diffuser, which seems to run out of water quickly. It also runs on a timer, which can be set at 30, 60, 120 or 180 minutes. Being able to run it for 3 hours is great for night time when I’m trying to keep the girls mellow or diffuse something to help fight off bugs that may be lurking. The girls like that it has four different color settings, and that each color setting has two brightness levels. I like that I can turn the light completely off and it will still run for the set amount of time. So far, I have found the Gurin ultrasonic aromatherapy diffuser to be a good purchase, especially given the good price available right now on Amazon.com. 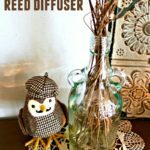 If you’ve been wanting to try an essential oil diffuser, click here to read more reviews. No heating or burning means that the essential oils are damaged. I learned that it covers up to 220sq ft. The diffuser makes one very quick low beep right before its about to turn off. The aromatherapy diffuser makes 2.4 million ultrasonic vibrations per second! It’s pretty neat how it works. Oh! I love that it has a timer with so many different options! I love the color change option. Beautiful! I learned that with this diffuser no heating or burning means the properties of the oil are not broken down. I love that it has 4 timer settings & that it is also a humidifier. it has 6 color led lights that turn off with a timer. it uses NO heat or burn that means the oil don’t brak down. I like that it runs on electricity and not batteries. Auto shut off without water is super too! I love the auto shut off capability. I learned that it has a built in timer that has several settings. Nice! very good product thank you for your review help me. I have had this diffuser for about a month now and it works well. It is quieter than my more expensive diffuser and emits a nice amount of mist. I really like that it comes with a timer function so that I can turn it on with some lavender EO before I go to sleep knowing the diffuser will turn itself off. I also like that I have the option of turning the diffuser light off.